Karthika Deepam, a festival of lamps, is celebrated in Tamil Nadu and Kerala. It falls in the month of Vrichigam/Karthigai (as per kerala/tamil calender). Houses and streets are lit up with rows of oil lamps in the evening of the festival day. As a kid i used to excitedly light lamps and place it in a decorative manner outside the house. Now being in a small apartment i decorate my house with fewer lamps. 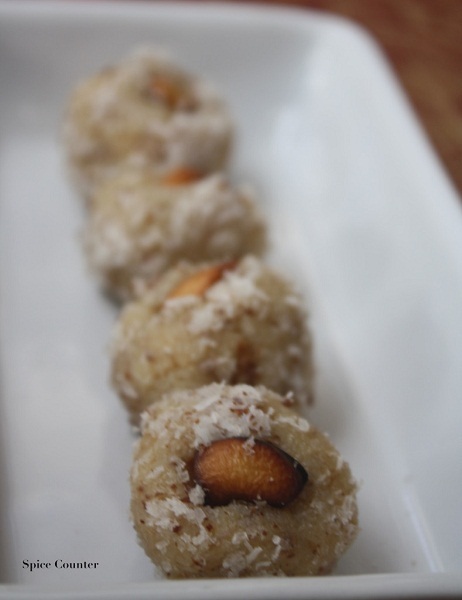 Cutting to the chase, i decided to make Coconut Laddu on the occasion of Karthika Deepam. The recipe is very simple and the dish can be prepared in ten minutes. Fry the cashews till golden brown and keep them aside. Add the shredded coconut to the same pan and fry for about 2 minutes. Now add the condensed milk while stirring constantly. In about 3-4 minutes the mixture will start thickening. Add the fried cashews and cardamom powder to this and mix well. Once the mixture starts leaving the sides take it off the stove and leave it to cool. Smear your palm with ghee and make small coconut balls. Roll this over dessicated coconut and serve.